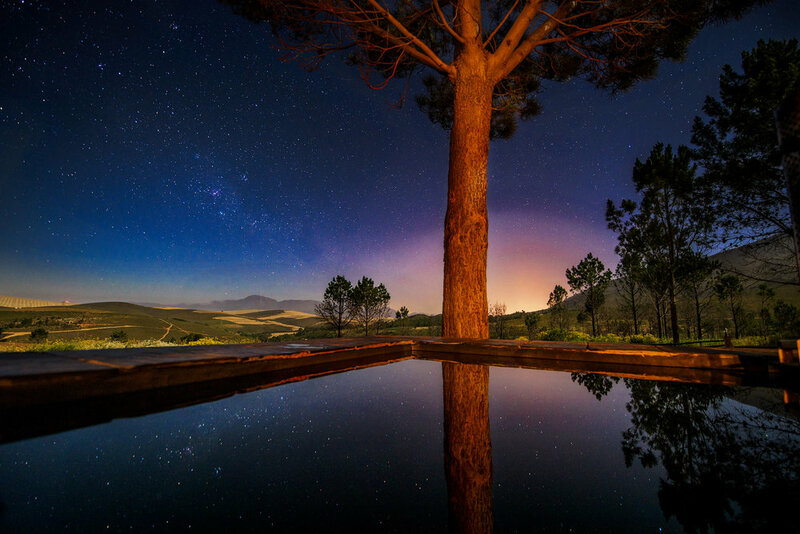 Midnight stars reflect in the wood-fired hot tub at Kolkol Mountain Lodge. "There aren't lions in this part of South Africa, are there?" "Then what was that sound?" Warm, tea-colored water (that we had been assured was safe) lapped at our bare skin as we sat late into the night in the wood-fired hot tub. The roaring didn't appear to be too far off. We each eyed the distance to the cabin door. "I don't know. Donkey, maybe." "Maybe a cow giving birth?" "It sounds like a lion to me." I paused. "I know. It does, doesn't it?" A trail winds up into the hills on the grounds of the Kolkol Mountain Lodge near Botrivier, South Africa. We'd come to South Africa's Western Cape to see the Kirstenbosch Botanical Gardens and dive with sharks ( ... my wife's idea of relaxing) before beginning a month traveling in Africa in earnest. We worked in a couple of days relaxation (my idea of it) between the two. We'd heard from a number of folks that your first trip to Africa should be to South Africa. I suspect they meant your whole first trip, but three or four days should suffice, shouldn't it? Having spent a few weeks exploring, we understand what they mean, ... and would likely offer the same advice, especially if you're not a terribly experienced traveler. South Africa has much of the infrastructure and a rhythm familiar to westerners, but with glimpses of something a little rawer, deeper. It's a great place to get your African toes wet. The hiking was spectacular right out of our back door, with trails running up the valleys, looping over ridge lines, and soaring out across high natural benches. We saw relatively few birds in the higher open heath, but drainage bottoms, with their larger shrubs and the occasional copse of trees, teemed with them. Below a young Neddicky (best guess) alights on a Red Pagoda plant (best guess). A juvenile Neddicky rests on a Red Pagoda plant. The Cape Sugarbird (below) is one of six species of bird endemic to the Fynbos. They occur nowhere else in the world, but were a common sight amongst the shrubs here. A Cape Sugarbird, endemic to the Fynbos, shows off its enormous tail. If you do have the good fortune to make it to the Fynbos for a few days, we can highly recommend the cabins at Kolkol Mountain Lodge. Only an hour outside of Cape Town, they felt wonderfully isolated and remote, and in many ways were: fifteen minutes down a dirt road, and another kilometer up an even narrower double track. It's worth trying to arrive before dark if you can. One night we laid in bed with the bedroom door open for a good while, listening to a pair of owls call to each other in the pines just out back. Another evening, coming back from a hike at dusk, we caught a glimpse of a caracal loping down the hill toward our cabin. Each cabin has a wonderful deck with a private wood-fired hot tub, ... from which it turns out you can listen to lions roar at night. And they were lions. The deck and fire pit of King Cabin at the Kolkol Mountain Lodge. Just down the hill there's a wildlife sanctuary, Cornell Skop Farm, which does indeed have a number of lions in its care. Lions which have been known to carry on a bit after the sun goes down. There's plenty to ponder from the wood-fired hot tub after the sun cedes its reign: the rolling farm country, an enormous sky dotted with stars, and the roaring of lions from a nearby sanctuary (warm hot tub or simmering soup? ).